Arrow Video continues to release George A Romero’s non-Zombie classics. You’d have to be crazy to pass this up! 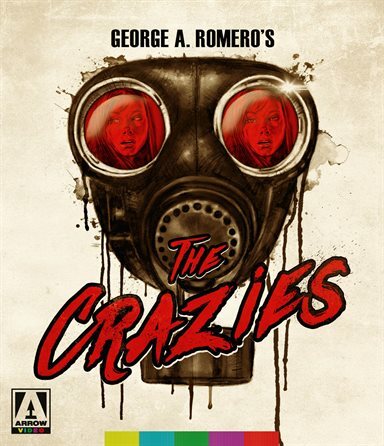 The Crazies was part of the canon of films Romero created that included common themes like zombies and bloodshed. The obvious distrust of the government, especially the military, is seen again and again, and this is no exception. Trixie, the biological agent gives the military Carte Blanche to take over Evans City and the surrounding areas, to contain and destroy those infected. However, we soon realize, our protagonists have as much to fear from the soldiers as they do from the infected. And perhaps, even from each other. In the Crazies, we can see shades of what was to become Dawn of the Dead, perhaps Romero's greatest zombie film and my personal favorite of his works (Although "Day" is an extremely close second). George's dystopian view of a nation at war with, even devouring (literally), itself is never more obvious than it is here. Arrow has done an outstanding job on the 4K restoration from the original 35mm camera negative, AVC encoded 1080p transfer in 1.67:1. The film has never looked better from the hazmat soldiers to firetrucks and even the blood that all seem to pop onscreen. There are some dark moments that possess some graininess but all in all the transfer is solid and is the best version I have ever seen. The audio is taken from the original, uncompressed PCM Mono, and while it's nothing to write home about, and in spite of some boxiness in the audio, most of the dialog is up front, and clear. The soundtrack is at-times off-putting, especially some of the electronic music, but I chalk that up to budgetary constraints. All in all, there's little to find fault with. What always sells it for me though are the extras and my favorite in the bunch are Romero was Here: Locating the Crazies and the guided tour with Lawrence DeVincentz, who takes us around Evans city and other locations used in the film was fun. Crazy for Lynn Lowry and the Q&A with Lynn were excellent, as well as the behind the scenes footage with commentary with Lawrence DeVincentz. While there are tons more on this disc, I would like to have had a commentary by George himself, there's plenty out there, and it would have been a nice addition to complete the extras. There is no doubt the impact this film has had, not just on the genre, as a whole, but on Romero himself. It even spawned a remake in 2010, that George executive produced, which was surprisingly tense, intelligent and did justice to the original. The Crazies could have been forgotten and has easily been overshadowed by his zombie films but thanks to Arrow Home Video, we finally get the definitive version. You'd have to be crazy to pass this up. Download The Crazies from the iTunes Store in Digial HD. For more information about The Crazies visit the FlickDirect Movie Database.